Lake Oswego's Collin Bracken shared the spotlight with 13 carries for 210 yards and two touchdowns, including a 77-yard TD run on the Lakers' first offensive play of the game, while quarterback Jackson Laurent completed 11 of 17 passes for 272 yards and four touchdowns. But Filkins was the big story on a night when he touched the ball only seven times — 10 if you count the three times he had to punt — and finished with 207 yards and five touchdowns. "Sometimes the football finds you," Filkins said. "We have so many people on our team that can get the ball and make plays. Tonight it happened to be me. It felt good. Great game." The Pioneers? It was 21-3 late in the first quarter before they gave their fans much to cheer about. Even then, the best they could do was match Lake Oswego score for score in the second quarter as they went into halftime trailing 35-17. Oregon City's hopes for a second-half turnaround were dashed after the Lakers (3-0 overall, 1-0 in Three Rivers League play) scored touchdowns on their first three possessions of the third quarter to turn the game into a blowout. "We've got to do a better job of being detail-oriented and finishing," Pioneers coach Dustin Janz said. 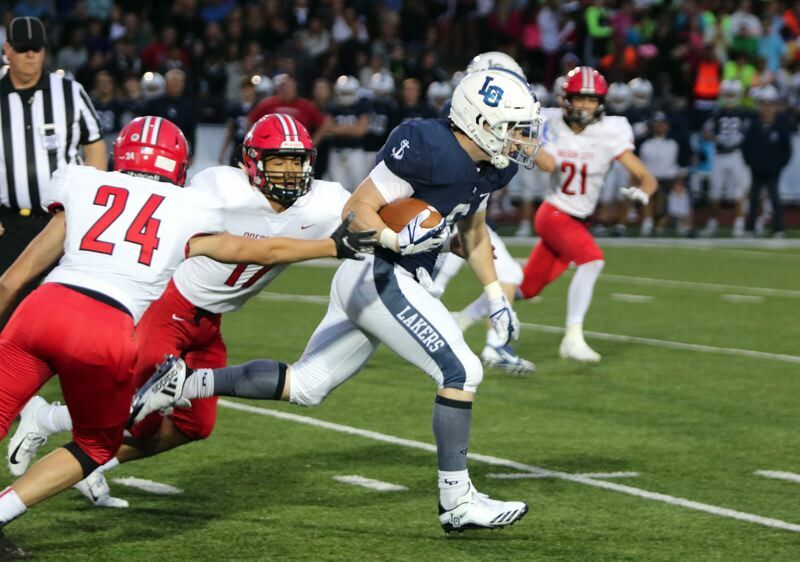 "Lake Oswego is a good football team. I thought our offensive game plan and defensive game plan were good. Obviously, they made some big plays. We've got to do better there. "But everything they did, we were prepared for. We were in position to make plays. We just had one or two things go wrong on any given play and all of a sudden, it's a big play or a stalled drive or whatever it may have been. It's something we've got to get better at." After a quick stop on the Pioneers' first possession, Lake Oswego scored on one play — Bracken's 77-yard run — to lead 7-0. After another Pioneers' punt, the Lakers went on a seven-play, 63-yard scoring drive that ended with Filkins running the final 12 yards after taking a direct snap on a third-and-1 play to make it 14-0. Oregon City's Zakayas Dennis-Lee answered with a kickoff return to the Lake Oswego 33-yard line, and four plays later, Wyatt Lovell made a 25-yard field goal with 3:30 to play in the first quarter. Then came another one-play scoring drive for the Lakers — this one a 65-yard touchdown pass from Laurent to Filkins. It started as a short swing pass to the right flat, Filkins then broke four tackles as he ran the width of the field before turning up the left side and scoring to make it 21-3 with 3:14 left in the first quarter. "Filkins making the plays he made ... unreal," Lakers coach Steve Coury said. "You throw a ball 10 yards and 90 yards later or whatever it was and he scores. He just has a way of making guys miss. I mean, he's just really hard to bring down." In the second quarter, the teams traded punches as Oregon City's Jahleel Heath scored on a 14-yard touchdown pass from Colby Iverson, Filkins scored on a 46-yard touchdown pass from Laurent, Dennis-Lee scored on a 1-yard run for the Pioneers, and Filkins scored on a 35-yard touchdown pass from Laurent that made it 35-17. "Casey Filkins made my job a little bit easier," said Laurent. "I mean, if they try to cover him one-on-one, I'm going to throw to him every single time and he's going to make moves and get as many yards as he can." Lake Oswego opened the second half with a 10-play, 65-yard scoring drive that ended with Filkins again taking a direct snap and running up the middle to score from 4 yards out. While Oregon City continued to compete, their mistakes and inability to prevent big plays sealed their fate. "It happens because we're undisciplined and we're not consistent, and we've been that way since I got the job," said Janz. "We're trying to fight through it and figure it out and I think we're getting close, but we're not there yet." Lake Oswego closed out the scoring with Laurent throwing a 27-yard touchdown pass to Thomas Dukart, Bracken scoring on a 36-yard touchdown run and Connor Willihnganz scoring on a 42-yard fumble return. For the game, the Lakers ran 45 plays and finished with 529 yards total offense. The Pioneers ran 66 plays and had 279 yards. "Our kids are playing well," Coury said. "When you've got skilled guys like we have and you've got athletes like some of the kids we have, you tend to come out with some big plays. And if you're getting big plays, you end up scoring some points. To score 63 is a little unusual, but it's a good win." Next up, Lake Oswego plays at reigning Class 6A state champion at 7 p.m. Friday, while Oregon City hosts Liberty at 7 p.m. Friday.